mbed TLS provides secure SSL/TLS communication using MDK-Professional's Network component. While ensuring a maximum amount of security, it can be quite complex to configure a solution that runs on devices with limited resources, such as microcontrollers. 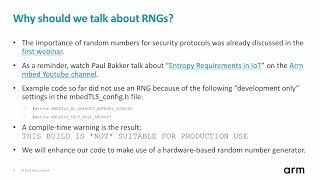 We have run a series of webinars that explain the background of TLS and that contain real-life examples that can be used in an end application for communication security. Attacks on IoT products have increased in recent years as a result of vulnerabilities relating to communication security, among others, being compromised. Watch these two webinar recordings to learn how to prevent such attacks by adding security to your IoT device with Mbed Transport Layer Security (TLS). See how Mbed TLS helps you to prevent malicious attacks by adding security to your IoT device. Part one. Download the slide deck and the source code that have been shown and used in this webinar. 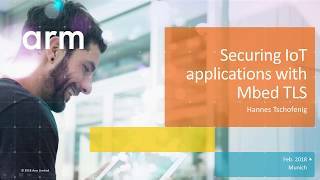 See how Mbed TLS helps you to prevent malicious attacks by adding security to your IoT device. Part two. Download the slide deck and the source code that have been shown and used in this webinar.. Learn why and how to use random number generators for securing your communication. Download the slide deck and the source code that have been shown and used in this webinar. 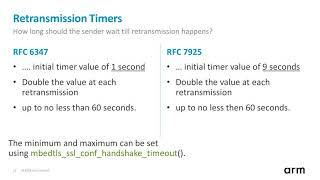 Learn how to DTLS to secure UDP and non-IP based communication. Download the slide deck and the source code that have been shown and used in this webinar.